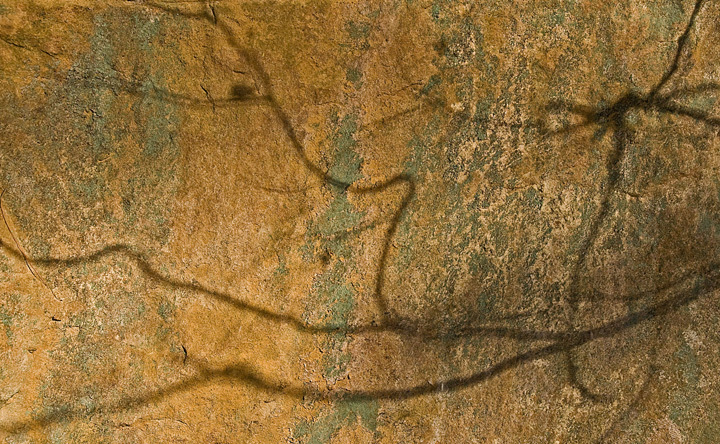 Dunnville Sandstone was discovered in the late 1800’s when the Railroad installed a line along the Red Cedar River running south of Menomonie, Wisconsin. The sandstone was of a high quality and led four different firms to start quarrying sandstone in the area. The Dunnville Cutstone Company was the most well known. The mines all closed opening occasionally to quarry stone for special projects. However, several years ago the Dunnville Cutstone Quarry was reopened. 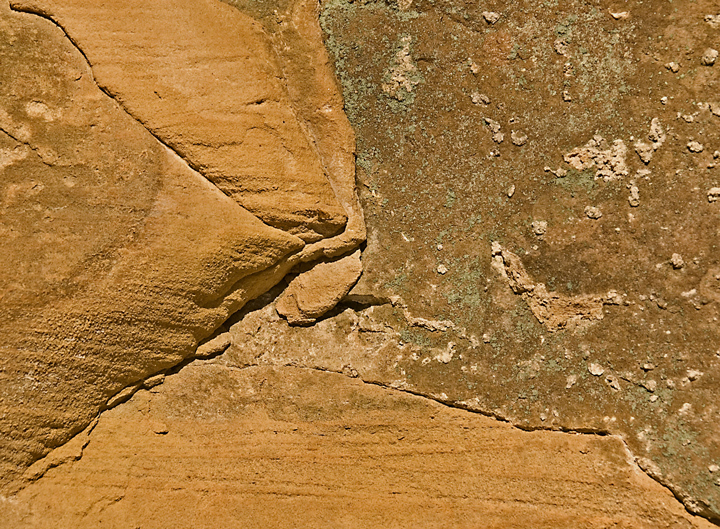 Dunnville Sandstone was used in many local building including the Mable Tainter Theater and the Louis Smith Tainter House both located in Menomonie. The Theater was recently remodeled and Dunnville Sandstone was used for a new addition. Dunnville Sandstone was also used for the high alter of the Saint Thomas Church at Fifth Avenue in New Your City. 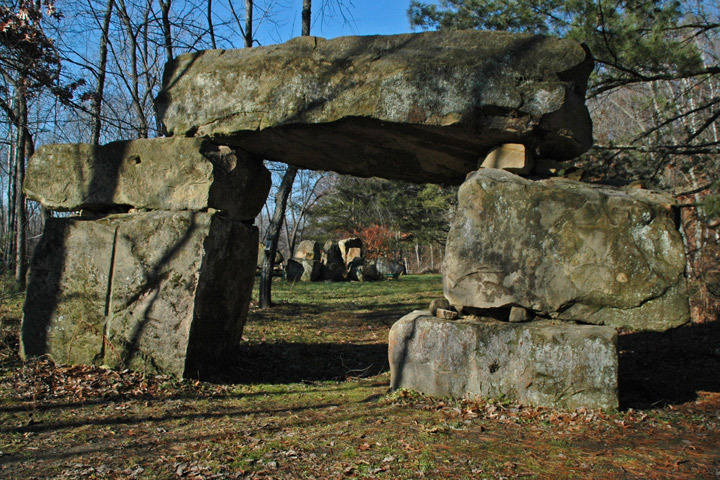 The Dunnville Quarries’ were located along the Red Cedar River about a mile north of where the river intersects with County y. The old railroad bed has been converted to a bike trail know as the Red Cedar Trail. It runs from Menomonie, Wisconsin to the Chippewa river. 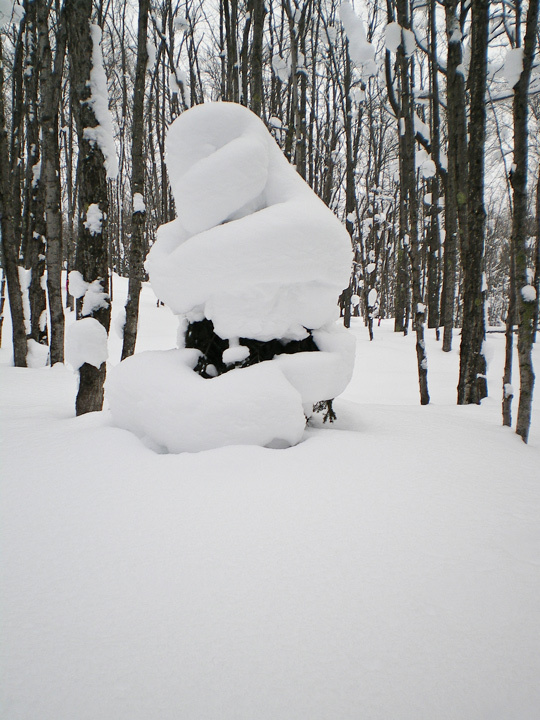 In the winter the section of the trail from Downsville to County Y is open for skiing, hiking and snowshoeing. 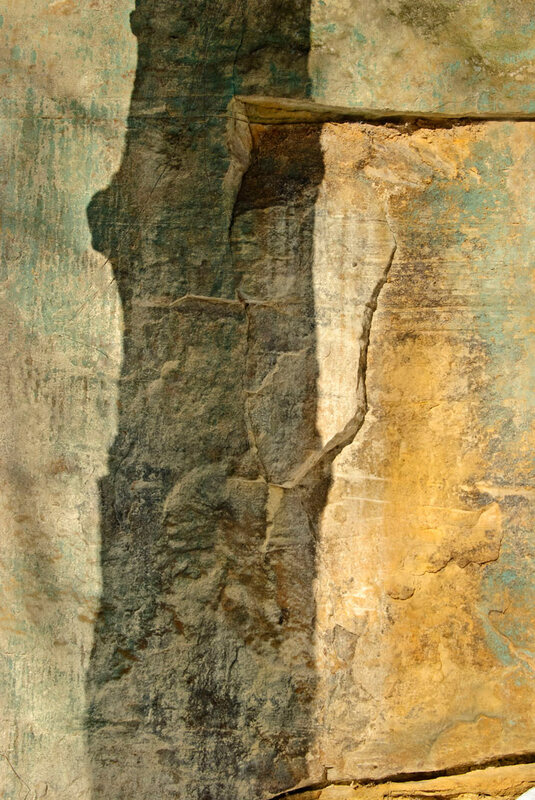 I like to walk this section of the trail in the winter because late in the afternoon on sunny days the light brings out the colors on the exposed sections of the Dunnville Sandstone in the area. Since the Dunnville Cutstone Quarry is active you can no longer enter the area. You can see part of the quarry from the trail. Just north of the current Quarry are the remnants of another old quarry with some old equipment that can be seen just off the trail. One of the things I love about winter is a good blizzard. We had one this past weekend. 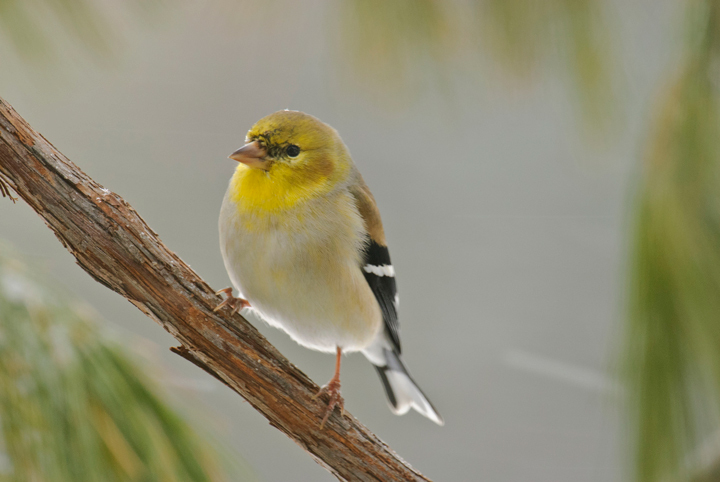 I love to sit in front of my fireplace in my favorite rocking chair watching and photographing birds. 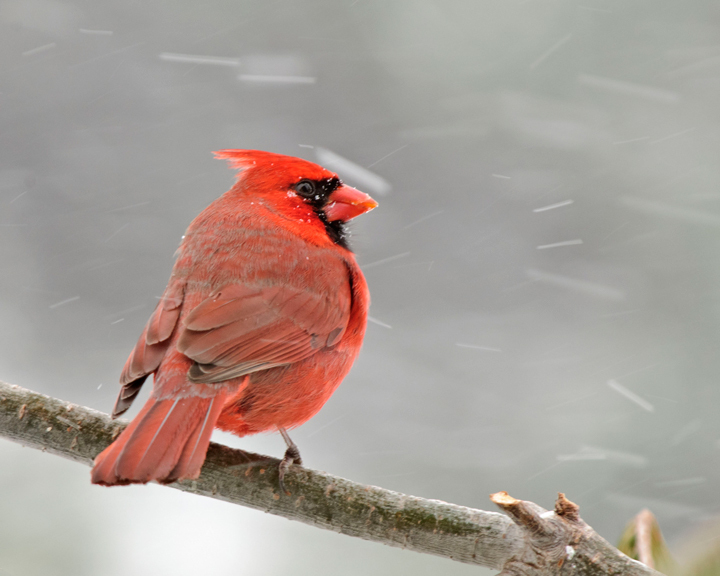 A nice snowfall with big flakes are the ideal conditions for photographing birds in the winter. We don’t always get what we want. On Sunday it was really difficult to photograph because the storm was so intense the birds had trouble hanging onto anything. The wind also blew the snow into the windows so I couldn’t see out. 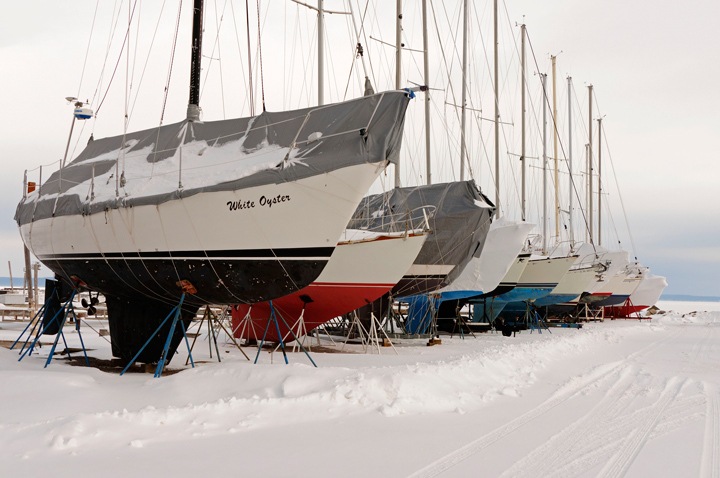 I gave up the idea of photographing because conditions were so bad and assumed it was a wasted blizzard. We were scheduled to get a little snow on Monday but as it turned out it snowed all day with conditions a little better for photography. The wind was still blowing but it wasn’t blowing snow into the windows so it was possible to photograph. 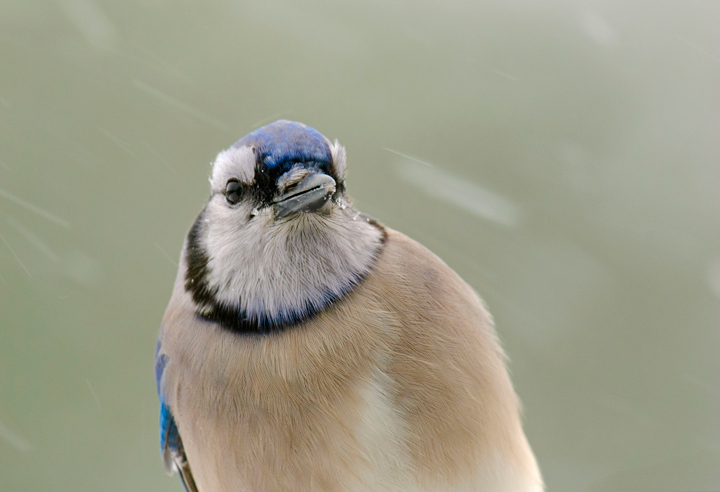 I was able to get some nice photos of the birds around the feeder. 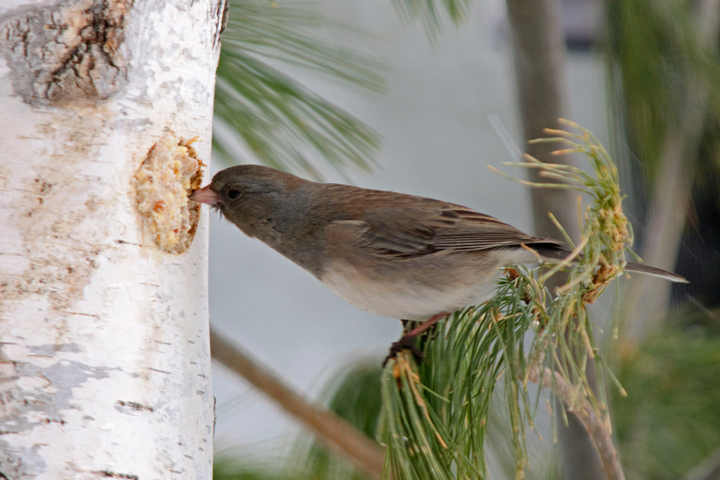 Normally the Juncos don’t feed at the suet feeder but on this particular day there was one Junco that seemed determined to get some suet. 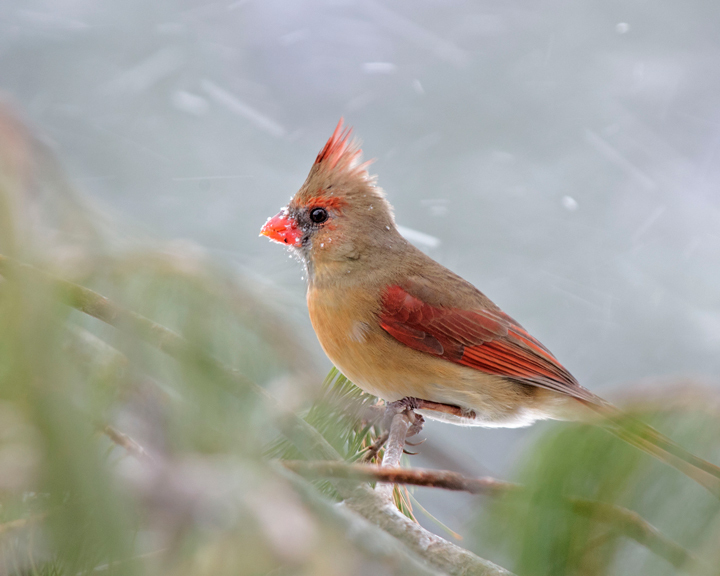 He couldn’t land on the feeder but there was a White Pine branch that was close enough for her to reach the feeder. Unfortunately the wind was blowing so it was a stretch to reach the feeder most of the time. More photos from the storm on my Website. 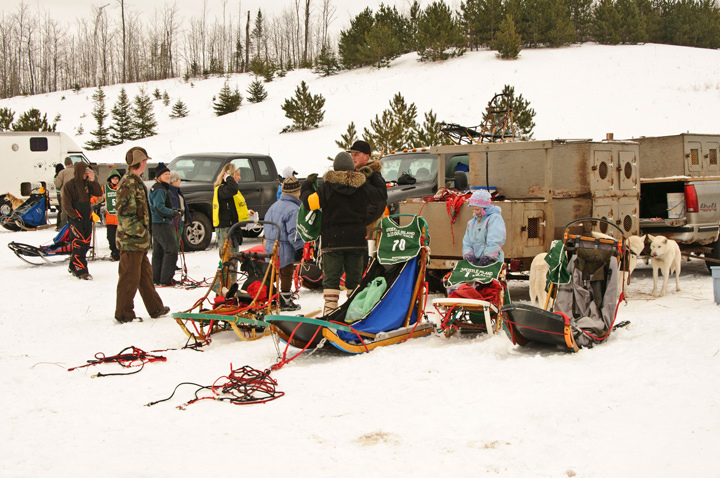 Last Friday we drove up to the Ice Age Trail for some hiking/snowshoeing. Our first stop is always the Interpretive Center to check on trail conditions and find out what is going on in the area. It is also a great place to visit if you have kids. They have live fish, snakes and turtles at the center as well as stuffed animals and birds. They also have a variety of activities for kids. 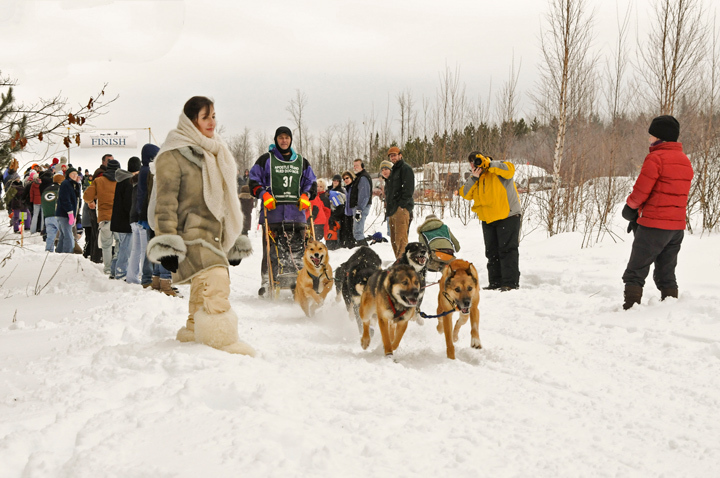 In the winter they also have snowshoes available for use. We happened to encounter Stanley at the visitors center. 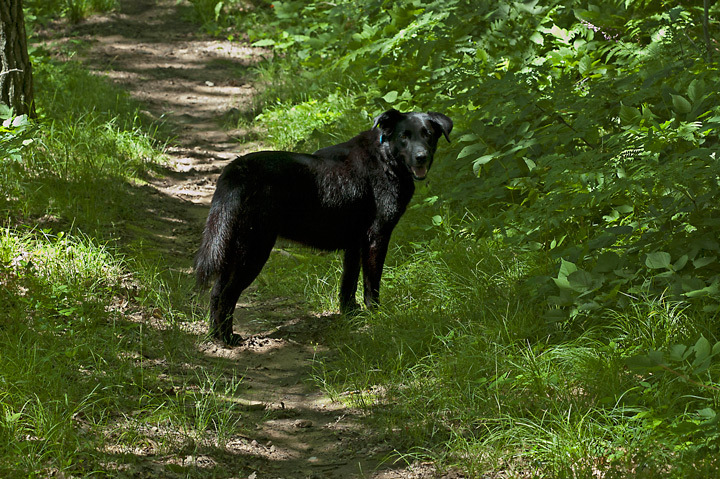 He is the unofficial hiking companion dog that will hike the trails with you at no charge. He resides in the area but spends a good part of his time walking the trails with hikers. His name is Stanley and he is kid friendly. He was on hand at the center on Friday but had just come back from a hike with someone else and didn’t seem inclined to go out again. This is a photo of Stanley taken last summer. Since I’m generally doing photography on my hikes Stanley usually becomes bored and heads off to do his own thing. We generally take the 4.5 mile loop trail that starts from the visitors center. We weren’t sure what to expect in terms of trail conditions because the trail is heavily used snowshoe trail in the winter which means it could also be a little slippery after warm weather. We took along the snowshoes and traction devices for our boots just in case. 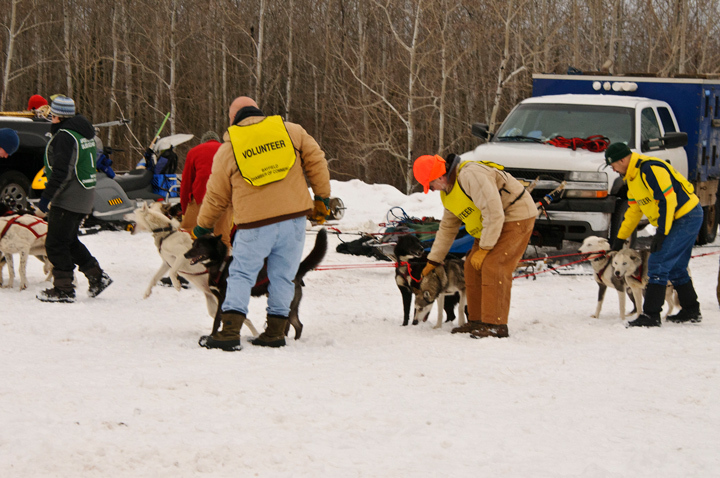 As it turned out the trail was hard with some ice so we chose to use the traction devices. It was easy walking and we made good time. Also I didn’t stop to take any photos so that speeds things up. My recommendation for navigating the trail this time of year is to bring along snowshoes, traction devices and hiking poles so you are prepared for a variety of conditions. It was one of the few bright sunny days we have had recently with temperatures in the mid 20’s. There was some strong winds blowing so it was cool on the ridges. We followed up the hike with a stop at the Bloomer Cafe for some pie alamode. There are more photos of this segment of the Ice Age Trail on my website. It’s been a tough year for White-tailed Deer on the farm. 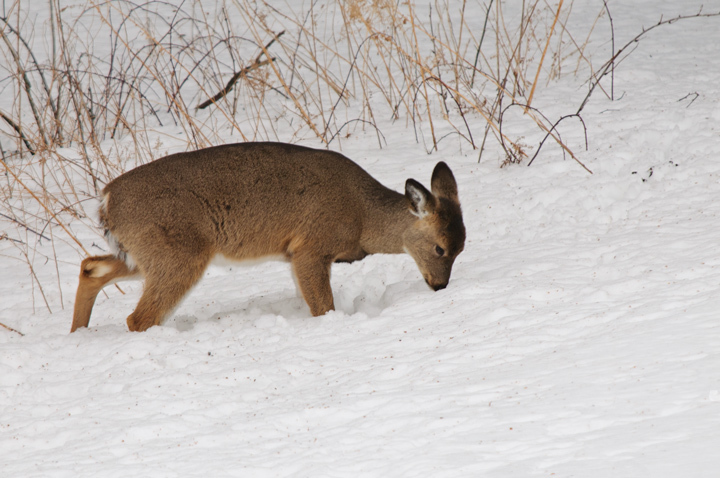 We had about a foot of snow the first part of December and ice after that so it has been tough for the deer to find food. 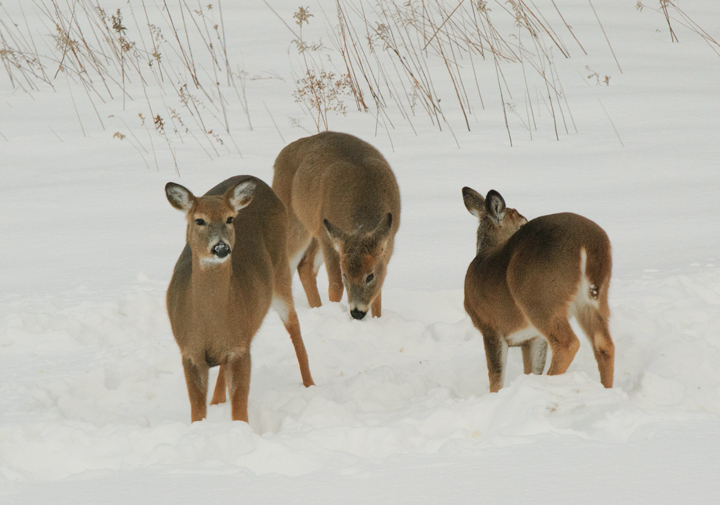 this is a shot of three doe looking around my pumpkin patch in the garden in late December. I normally leave some pumpkins in the garden for the deer to eat. Unfortunately they finished them off quickly. I gave some thought to feeding them but I’ve been told that can become quite a project. I have seen them around now that it has gotten a little warmer. This one out feeding in the back yard on some dried up Goldenrod. I noticed that they also seemed to be eating black sunflower seeds that had blown out in the yard from the birdfeeder. I thought they might come up to the birdfeeder but they went back into the woods. Recently we took a long weekend road trip the U.P of Michigan. 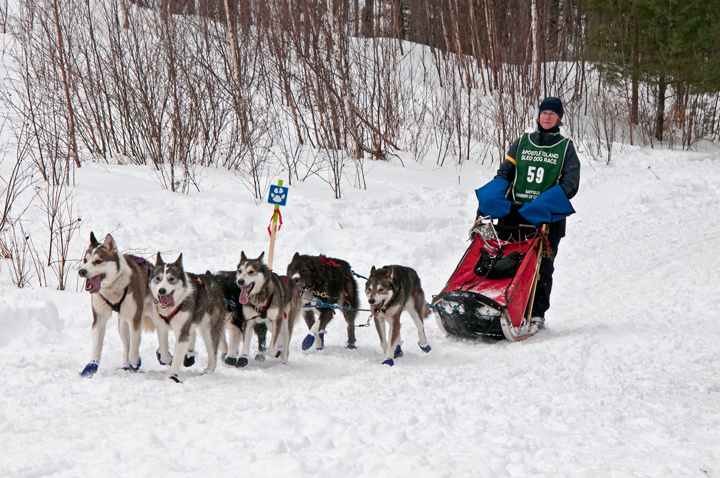 The goal on the second day was to ski the Keweenaw Mountain Lodge Ski Trails outside of Copper Harbor. After we finished skiing we decided to drive down to the to the northern terminus of highway 41 just east of Copper Harbor. Highway 41 goes 1990 miles from Copper Harbor to Miami, Florida. I thought it would be fun to take a picture of the sign hanging in 5 feet of snow to show our southern friends what it is like up north. We drove up to Fort William and took a few photos of the Copper Harbor Lighthouse but the day was overcast and the light wasn’t very good. We then continued on to the terminus of highway 41 only to find that the DOT had removed the sign for the winter. 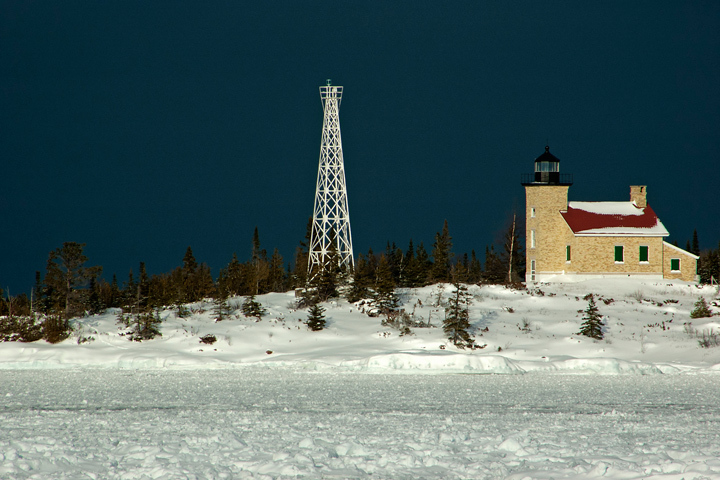 On the way back to Copper Harbor we noticed that the sun had emerged and was shining directly on the Copper Harbor Lighthouse. The scene was even more dramatic because there was a lake effect snowstorm out in the lake and the skies were almost black in the background. 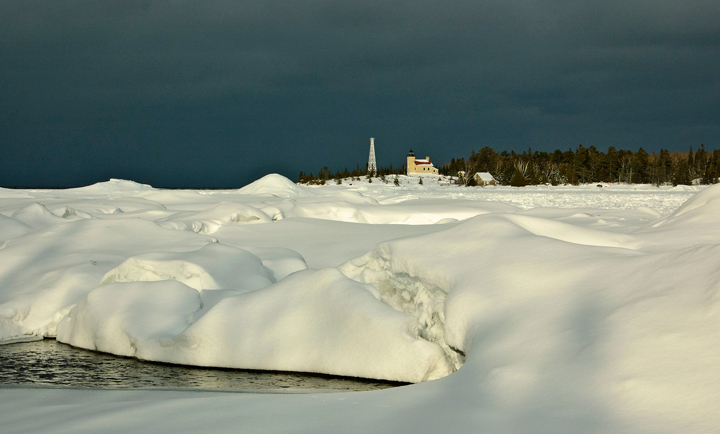 We quickly pulled over and were able to get some dramatic shots of the lighthouse. 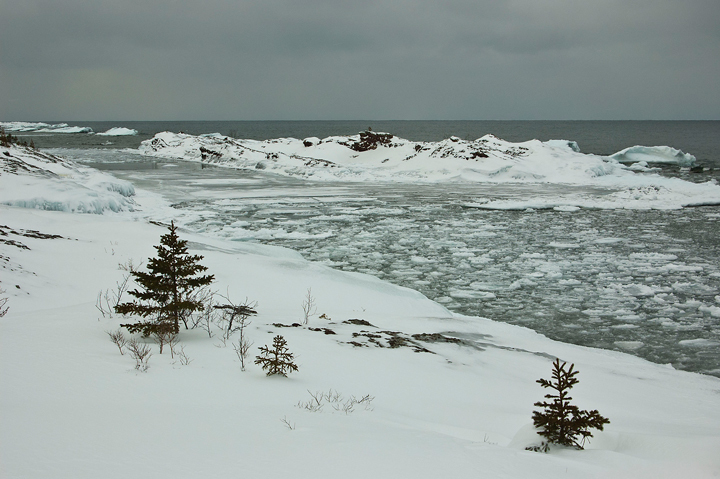 We then drove back along the west coast of the Keweenaw on highway 26. There a few more shots on my Website. During the long winter months I try to make at least one trip to Dells Mill Dells mill is located near Augusta, Wisconsin. The mill is an historical landmark built in 1864. It was originally a water-powered grist mill servicing the area until wheat production moved westward. The mill later was used to mill flower and grind feed. The mill is no longer operational but occasionally the mill wheel can be seen turning. It now serves as a museum that is open daily from May to October. The mill can be viewed from a bridge just downstream from the mill. In the winter there is access from the road west of the mill. 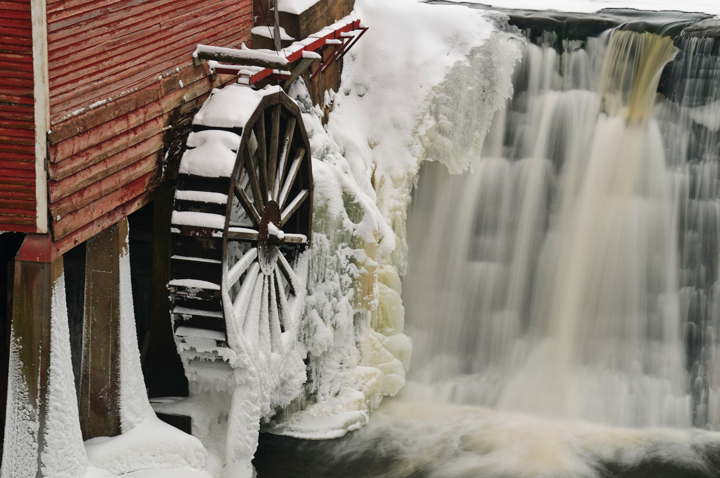 You can walk down to the millpond and out onto the ice to photograph the mill. The mill is situated south east of the bridge so the best time to photograph is later in the day. Your other option is the use High Dynamic Range photography in order to capture the varying light conditions. On one trip I happened to be photographing and noticed a couple of horses and buggies on my drive to the pond but didn’t think much of it. 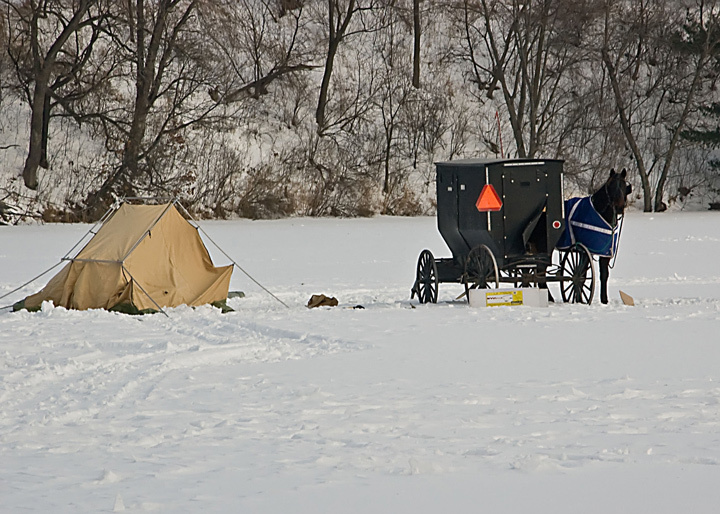 When I walked out onto the mill pond I found this horse and buggy out on the ice. There were a number of Amish men that had driven down to the mill to ice fish for the day. Another sight you will likely find at mill is the resident. You can generally find him directly below the bridge. 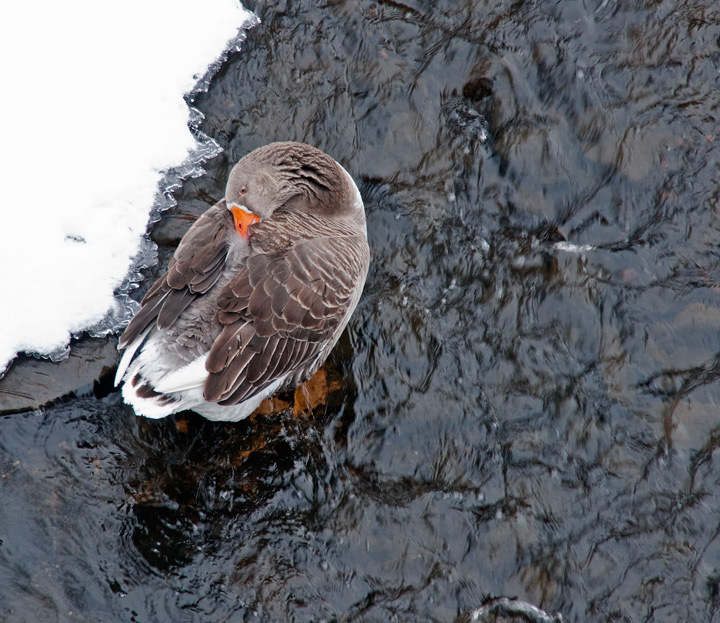 He seems to hang out below the dam throughout the year. 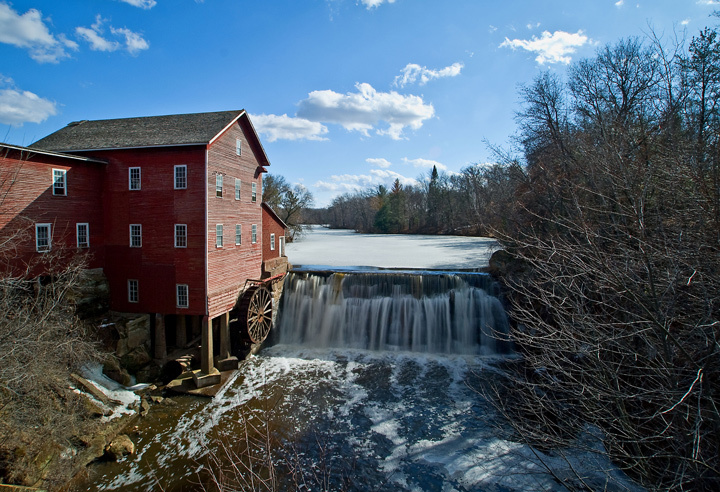 There are more photographs of Dells Mill on my website. This past fall I upgraded my tripod from a Manfrotto 190XB to a Manfrotto 055CXPRO3 carbon fiber tripod. I like the old one but in the intervening years I had acquired a couple of heavy lenses and wanted some additional stability. I had heard that carbon fiber was a little warmer in winter but cold is cold at -15 degrees and the last thing I want to be doing is carrying around a tripod in cold weather without some sort of protection. On my old tripod I had used some pipe insulation and that worked very well and was cheap. However, the new tripod had a leg diameter greater than one inch and I couldn’t find any pipe installation locally with the proper diameter. In addition, when I did wrap it with pipe insulation the diameter was too large for my small hands to fit around comfortably. What to do? The obvious solution would have been to search the major photography stores websites and look for something commercially available. That would have been too obvious. I decided to look around and see what I could find locally. I did locate a rubber pipe insulation at Menards that would provide a nice grip and good padding when carrying the tripod on my shoulders but that had the same problem as the foam insulation. It wasn’t the right diameter and my hands wouldn’t fit around the grip. One day I happened to be at Scheels Sporting Goods and noticed a Camo Protective Fabric Wrap that looked like it would be just the thing. However, it was $15 a roll and I thought that was a little Pricey Later in the day I stopped at a Gander Mountain Store to see if they had anything similar. They didn’t but a helpful store clerk said that what he used for his guns was veterinary wrap. It is something you can find at local veterinary stores or at a place like Farm and Fleet. We happened to have a Farm and Fleet in town so I stopped in later that day and found the wrap under the name Cohesive Flexible Bandage. It is something that vets use to wrap animals legs. It comes in 5 yard rolls and is 4 inches wide. It is self adhering so I could wrap it around the tripod legs and it sticks to itself but it does not leave any residue on the tripod. I can also remove it and use it again if I wanted to. It gave me twice the amount tape compared to the camouflage tape sold at Scheels and the best part was that it was less than $2 a roll. It comes in a variety of colors but not camouflage. I Purchased a role and applied it to my tripod. One role should do the upper legs of the tripod. It will take more if you really want to put it on thick. If you do that you will get a nice soft grip and something that will provide a cushion if carrying your tripod on your shoulder. In addition to protecting my hands against the cold It also protects the tripod legs from scratches, reduces glare, and provides a nice firm grip. It adheres to itself without adhesives although I did use a little electrical tape to make sure the ends were secure. It is also completely weatherproof. A great find and highly recommended. This past weekend we took another road trip. 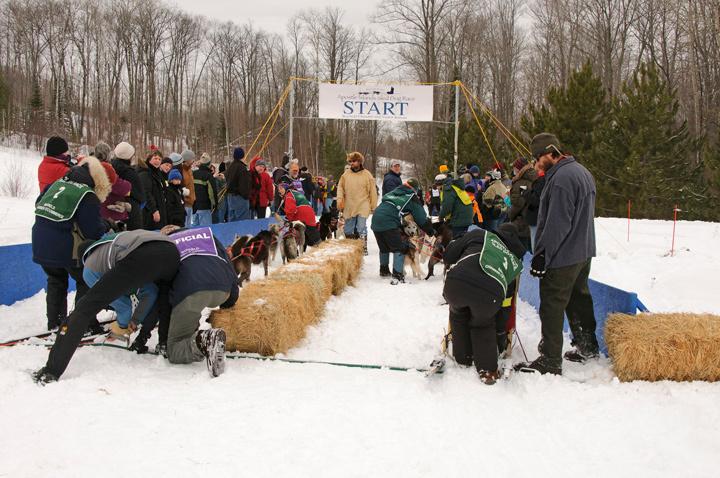 Our destination was the Apostle Islands Dog Sled Races in Bayfield Wisconsin with a little skiing in between. 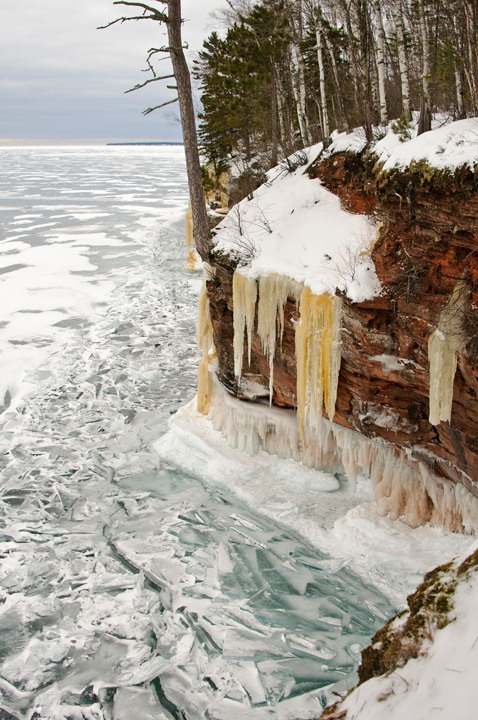 On Friday we stopped at the Apostle Islands National Lakeshore Headquarters in Bayfield to check on the accessibility of the ice caves and were told the ice has been moving with the strong winds we have been having. 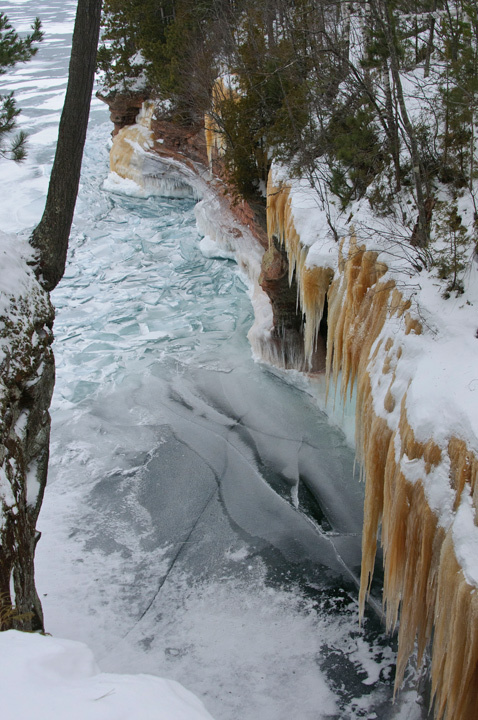 Protocol requires that the ice be stable for two weeks before the Park Service allows access from the ice. 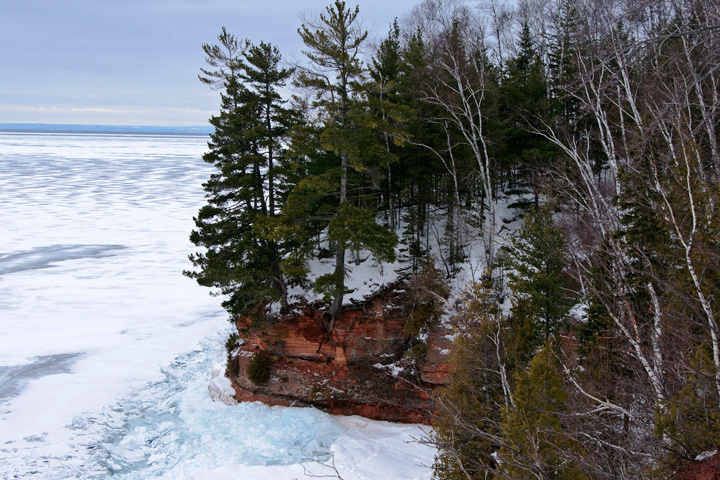 On Saturday after the dog sled races we decided to drive down to Myers Beach and hike the Lakeshore Trail which runs along the cliffs above the lake. The trail is two miles with limited views of the lake until you reach the two mile mark. 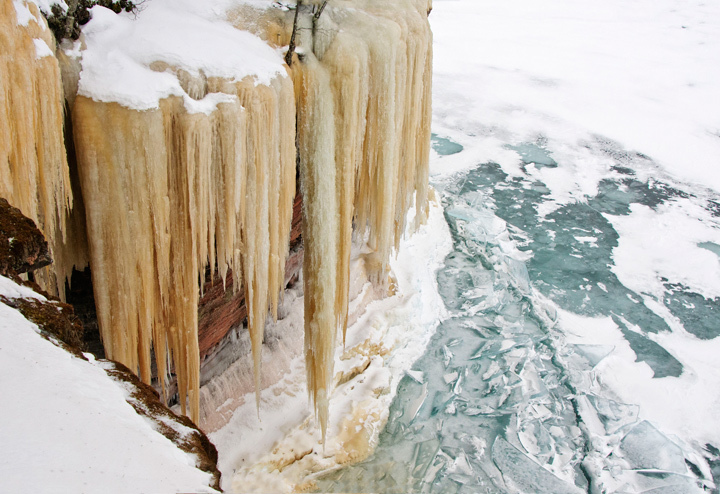 These shots were taken from the cliffs above the Apostle Islands Ice Caves. The trail is not marked. It is easy to follow when the snow is gone and but if you happened to stop after a big snow storm with strong winds it might be a little difficult to follow. On this particular day it was a popular destination and we encountered a number of other hikers on the trail. It takes about an hour to walk out to where you can view the ice caves. You basically have a couple of options when hiking the trail. 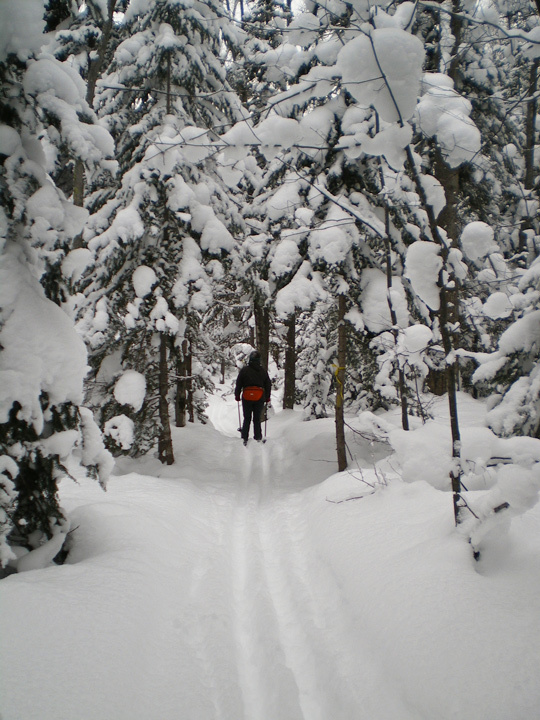 You can snowshoe the trail which is the best option if it is not well tracked or you have lots of fresh snow. There are quite a few steep sections on the trail where it drops down into ravines and then back up the other side. 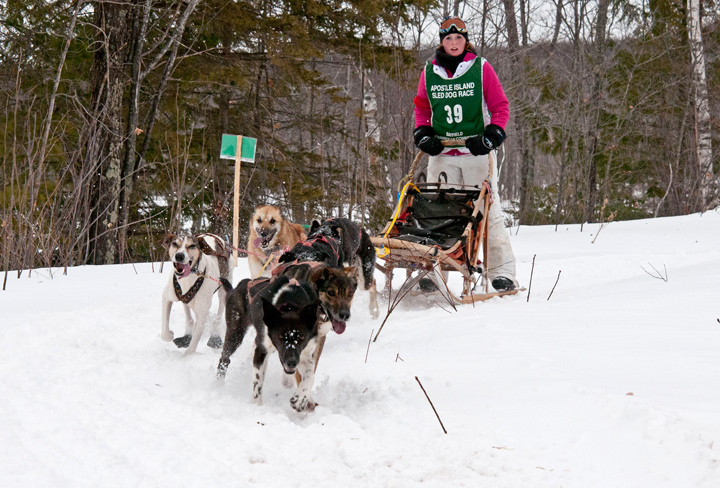 so it can be a little challenging with snowshoes. The other option is to walk the trail which appears to be the best option if the trail has been traveled quite a bit and the snow is packed. Since I had walked the trail a number of times and knew how steep sections of it were we brought along our adjustable snowshoe poles and cleats for our feet to provide additional traction. This made it an easy and enjoyable hike. 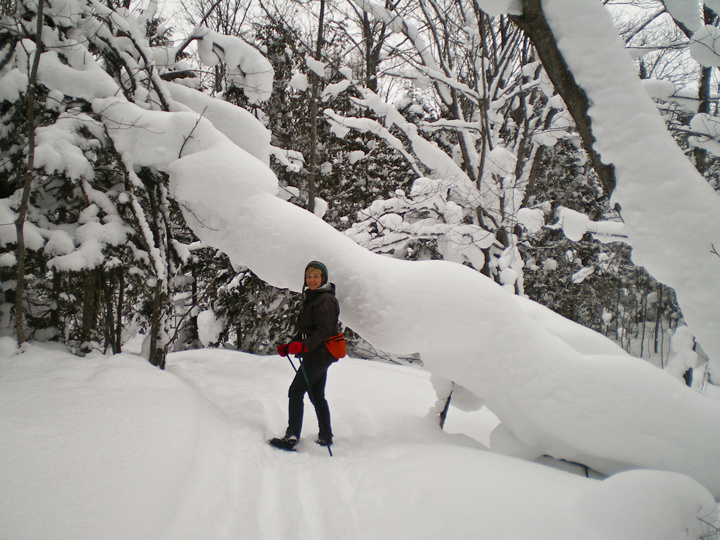 In my Blog posted a couple of weeks ago I described how we spent the day cross country skiing at the Swedetown Ski Trails. Toward the end of the day we spent a little time on the Back Country Trail and liked it so much we vowed to ski the entire 3.5km the next time we were in the area. On Sunday morning we had some time and more fresh snow so we decided to head out to Swedetown and ski the Back Country Trail. The Back Country trail is groomed occasionally to pack the snow down and still give the skiers a back country experience. 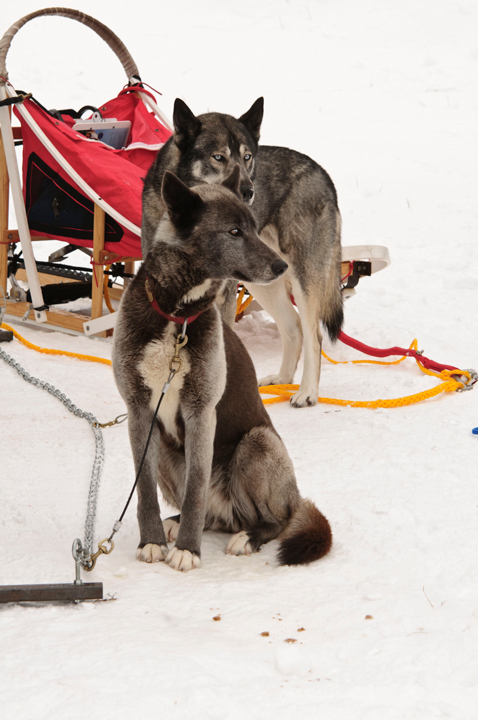 The grooming consists of packing and tracking. When we arrived it not been groomed and it was covered with about 8 inches of fresh snow. This is not a trail you want to take if it has just been groomed because it is narrow and doesn’t allow for much control when skiing downhill. It could also be very fast. You also don’t want to ski it with long skis because there are a lot of short ups and downs. 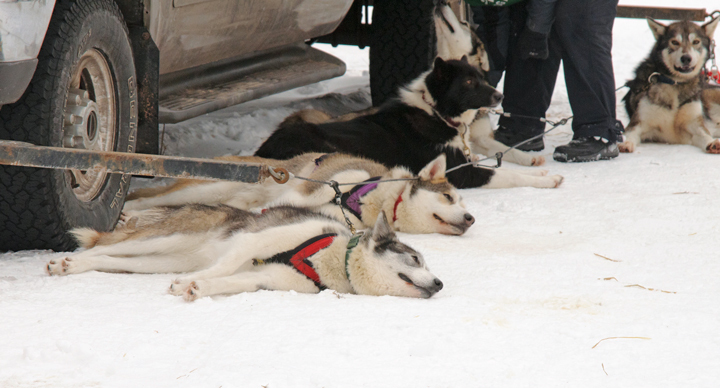 Some friends took it a couple of weeks ago just after grooming and they spend a lot of time on the ground and were soaking wet by the time they finished. The photos don’t do the experience justice. 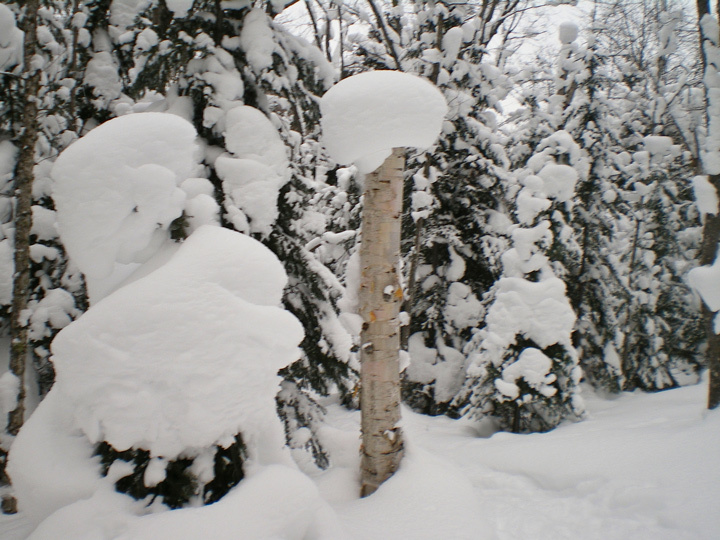 It is a winter wonderland as you glide through the trees covered with fresh snow. The best time to ski it is after a snowstorm so you get the real back country experience. I highly recommend taking this trail if you have the right conditions. It is clearly marked on the map at the trailhead and with signage along the trail.